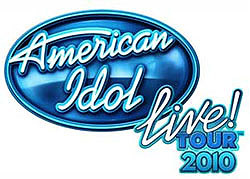 By the time the tour kicks off this summer, one of the 10 "American Idol" finalists will have been crowned the winner, but the entire bunch will hit the road on the "American Idols Live! 2010" tour. The 49-city tour will debut on July 1 in Auburn Hills, Michigan and wind up on Sept. 14 in Pittsburgh. The Top 10 finalists -- Aaron Kelly, Andrew Garcia, Casey James, Crystal Bowersox, Didi Benami, Katie Stevens, Lee DeWyze, Michael Lynche, Siobhan Magnus and Tim Urban -- will all be a part of the tour.